Have you ever been wondering, what the login facility on the Airwire website is all about ? It's the door to our support tracking and billing system. If you are a customer of ours and have provided us with your email-address, you can contact us to get access to your statement, invoices etc. In time it'll also be possible to track support queries. Airwire was established in the start of 2006 by Ciaran Maddison and Martin List-Petersen. Our aim was to provide broadband to areas in the west of Ireland where nothing else was available. We had been providing ourselves with broadband as there was no other option and saw the need among friends and neighbours - especially those who wanted to work from home or operate a business in rural Ireland. What started out as a fairly small provider in the Kinvara region covers now most of Co. Galway, the north of Co. Clare, the south of Co. Mayo,parts of Co. Roscommon and Co. Westmeath. Additionally we provide Fibre to the Home in Portlaoise and Limerick. As soon as 2009 Airwire had approx. 2000 users with fixed wireless broadband in the ISM band (as specified by Comreg and the european regulation body). We've enabled a few estates with pre-wired ethernet based services and we operate our own dark fibre in Galway, Athlone and Portlaoise. As of 2016, we've also partnered up with OpenEIR and SIRO and use them as last mile option, to get high speed broadband to our customers on VDSL and FTTH. (Fibre to the Cabinet and Fibre to the Home). These connections then are handed off to us as local as possible and carried to the Internet using our own network. The company currently consists of 9 employees and some freelance co-workers. The entire infrastructure, that the network of Airwire consists of, has been build from scratch and is owned by Airwire. Our connection to the outside world is provided by multiple carriers on a fibre ring, that connects Dublin, Portlaoise, Limerick, Ennis, Galway and Athlone. This fibre ring is also backed up using licensed radio links of our own, where possible. Essentially, our set-up means we are not dependant on one carrier or location. The first 2 1/2 years of Airwire's existance, we had no physical office, but still today, our network and the internet are our virtual office. Today, we operate small data center in the heart of Galway City and our support staff works out of our office in Athlone. Ultimately, Airwire strives to provide a broadband service that meets the needs of our customers. We believe that those of us living in rural areas should be able to access a broadband service that is as good as any available in urban areas. We have a good relationship with our customers and rely on customer feedback to help us continually improve our service. Airwire originally started as a partnership between Ciaran Maddison and Martin List-Petersen, but was incorporated as a Limited Company with the CRO under number 508961 in 2012. Our office is registered at the address Moy, Kinvara, Co. Galway. We are registered with Comreg, the Data	Protection Commisioner and are a Local Internet Registry under RIPE. Our logo design was done by Jeremy Green. who operates out of the rural parts of Co. Galway. The webdesign of this website was done for us by Peacock Design. It is customers like these - businesses and professionals - who need broadband to do their job and that's exactly why Airwire began. Some of the pictures on this website come from a professional photo library, others are taken by Keith Larkin and Martin List-Petersen from across the areas that we work in every day. The shot on this page, for example, was taken by Martin from Maghera in Co. Clare at 210m above sealevel. 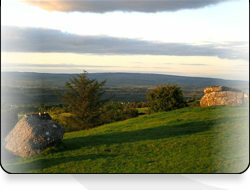 The spot has a beautiful view over Lough Cutra and into Co. Galway. On a bright day, the view would even extend into Co. Mayo. "Ag Nascadh Pobail an Iarthair"
"Ag Nascadh Pobail an Iarthair" translates to "Connecting the Western Community" in English. This is our aim and our network provides coverage across many Gaeltacht regions, where people speak Irish natively. Airwire is running an ethernet switched core on top of MPLS. This allows for very low latency and we can offer hosted MPLS anywhere within the core network. We have dedicated basestation gear to offer hosted MPLS to customers. The transport media for the network is fibre or fixed wireless. On top of that we run a dual-stacked IPv4/IPv6 network. Our topology allows that we can scale the network to deliver any amount of bandwidth, if requested by the customer. We have already started to deliver native IPv6 to customers by default, so if they have switched it on (Linux, current versions of Windows and Mac OS X would have by default) and don't have an incapable router between our CPE and their PC, they would actually be using it already.